Polycool Solar Control Inserts can be easily installed into your existing conservatory roof on a DIY basis if all roof channels are accessible from the gutter edge. N.B if all channels are fully accessible you will not need to lift or remove any roof panels during installation. 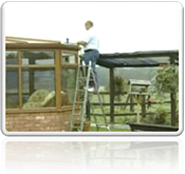 Should you find that access to the conservatory is restricted or if you have a Valley or box gutter where panels do need to be lifted or removed, our experienced conservatory technicians can install the product for you. For more information on our fitting service call us on 01386 830356. 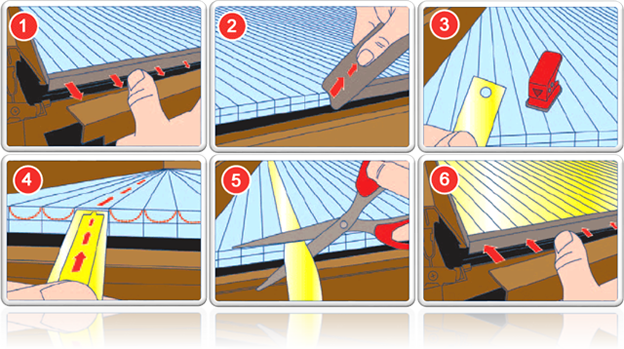 Easy step-by-step guide to installing Polycool Solar Inserts. For Everlite, Ultralite 500 and other widespan conservatory roofs you will not need to remove or replace any breather tape, these roofs will have channel end plugs or a fascia board covering the end of the roof panels. If time is at a premium or you would like us to fit conservatory roof inserts on your behalf, call us on 01386 830356 for a competitive fitting quotation. Our fully trainined Polycool installation techniciansare highly skilled, friendly, reliable and have years of experience attending to all areas of conservatory roofs. We do not use 'part time installers' or sub contractors who may not have the necessary skills or experience. 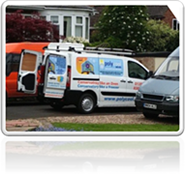 N.B - All Polycool fitting work is guaranteed for 12 months. If you would like a quote for our Installation Services please complete our Fitting Checklist and return to us. Alternatively call us on 01386 830356 and we will go through this with you over the telephone.